Who’s A Good Fit For EXPERT? Powerpack for SOLIDWORKS and Inventor: Expert and Pro both come with the Powerpack for SOLIDWORKS and the Powerpack for Inventor. 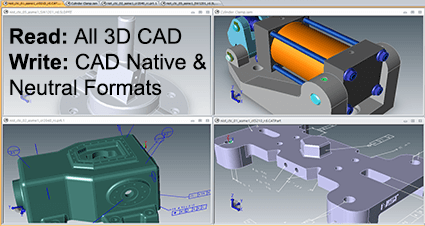 Write CAD Native Formats: Like Pro, Expert can write to neutral CAD formats such as ACIS, Parasolid and SMS, but Expert also gives you the ability to write to native CAD formats such as CATIA, JT and DWG. Boolean Operations: Boolean Union and Subtract to combine and derive new geometry. Split Operations: Split body and split faces based on existing geometry. Non-Uniform Scaling: Scale solid models at different X, Y and Z values. Atomize Assemblies: Automatically atomize parts in any assembly to the format of your choice. Extract PMI and Other Data to XML: Automatically create XML reports based on parts, mass properties or PMI data. CATIA V4, V5, V6 (up to R2019/R29); CATIA xcgm; JT (up to 10.2); SOLIDWORKS (2013-2019 – requires SWX on system); AutoCAD (up to 2019); TransMagic (R7-R12); Parasolid (up to 31.0); ACIS (R1.5-R2019/R29); IGES (up to 5.3); STEP AP203/AP214/AP242; SMLib (all); VDA-FS; Ngrain (up to 6.0); 3D PDF (up to 2018 SP2); 3D XML; STL; OBJ; PLY; HOOPS (up to 20); Collada; POD; U3D (ECMA-363); CGR (up to R2019); WebGL; 2D PDF; Image formats (Tif, Png, Jpg, Bmp). CAD Model Based Definition with TransMagic from TransMagic Software on Vimeo.